Cincinnati, OH - Pro Mach, Inc. announced today it has acquired Greydon, Inc., a leading manufacturer of inline printing and coding solutions for flexible packaging. The addition of Greydon expands Pro Mach’s extensive labeling and coding product offering and complements existing capabilities in flexible packaging. Pro Mach is known worldwide for developing innovative integrated solutions by combining capabilities from its multiple brands. Pro Mach expects product integration with Greydon to be particularly valuable to customers in shared end user markets such as medical device, pharmaceuticals, nutrition, food, meat, and dairy. Greydon, established in 1993, delivers high quality, innovative printing systems for a wide variety of flexible packaging applications and materials. Greydon’s focus has been developing inline or retrofitted printing and coding solutions for form fill and seal machines for medical device, pharmaceutical, and food packagers. Solutions include standard and custom products across a full range of print technology. Greydon’s new Genesis digital ink printing solution produces high definition output on most materials, including paper, Tyvek®, and flexible webs using UV ink. Genesis prints complete graphics and variable coding information that can be quickly and easily changed for different products and applications. Its innovative film handling and print system is patent pending. Genesis delivers ideal performance and return on investment for medical device and pharmaceutical manufacturers who require high quality labeling and coding for product validation, tracking, identification, and branding. York, Pennsylvania-based Greydon and its team, including company founders Greg and John Rochon, will join Pro Mach’s Labeling & Coding Group led by Alan Shipman. 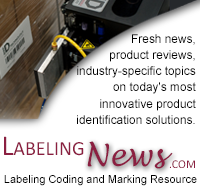 The Labeling & Coding Group includes well-known brands such as LSI and ID Technology, the leading supplier of printer/applicators in the North American market. Pro Mach is a premier packaging and processing machinery manufacturer and integrated system provider, with more than 25 equipment brands sold throughout the world. In addition to labeling and coding, Pro Mach manufactures and integrates solutions for bottling and capping, primary packaging, flexible packaging, material handling, and end of line. Pro Mach continues to grow rapidly with a global customer base and operations in North America and Europe. In June this year, Pro Mach added a Shared Services facility in Mexico to better serve Latin American customers. To learn more about Greydon visit them at Pack Expo Las Vegas 2015, September 28-30, Booth C-5219 or visit them on the web at www.Greydon.com.